Uncertainty can be combatted with good management. 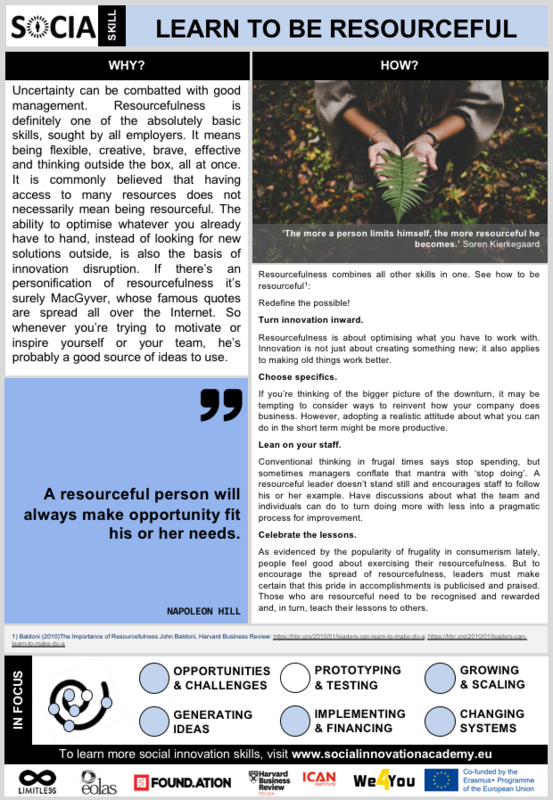 Resourcefulness is definitely one of the absolutely basic skills, sought by all employers. It means being flexible, creative, brave, effective and thinking outside the box, all at once. It is commonly believed that having access to many resources does not necessarily mean being resourceful. The ability to optimise whatever you already have to hand, instead of looking for new solutions outside, is also the basis of innovation disruption. If there’s an personification of resourcefulness it’s surely MacGyver, whose famous quotes are spread all over the Internet. So whenever you’re trying to motivate or inspire yourself or your team, he’s probably a good source of ideas to use. Do you actually want to learn to be resourceful?